The National Sea Turtle Foundation has provided a $2,000 Marine Turtle Scholarship for Masters and Doctoral students studying these animals for degrees in Biology and Environmental Science at Florida Atlantic University. This gift represents just the latest evidence of the Foundation's support of and commitment toward the research efforts and education of future scientists. This effort will ultimately provide benefits for the conservation, management and recovery of these threatened and endangered marine species. This year, four students received awards of $500 each. They are all involved in interesting and important research projects, described below. 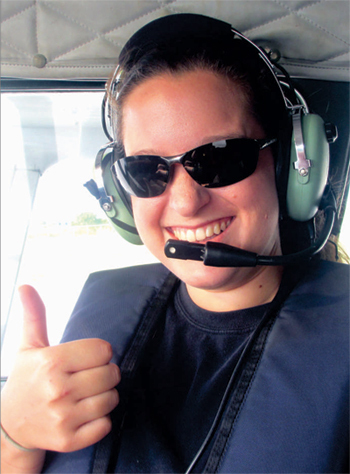 Once each month, Caitlin Bovery spends a full day in a small plane, crossing the Gulf Stream in closely spaced tracks. Her purpose is to survey the seasonal abundance of marine turtles within this current as it flows between West Palm Beach and Miami. Every animal is identified to species, and its location is recorded on GPS. This area of the Gulf Stream is being considered for the placement of devices that are anchored to the bottom, and that use Gulf Stream current flow to turn huge blades and generate electricity. A major concern centers around how such a device might affect sea turtles, marine mammals, and other organisms that use this current as a migratory corridor. Caitlin's study will help scientists determine where devices used for ocean energy development can be placed to minimize any impact on marine turtles. 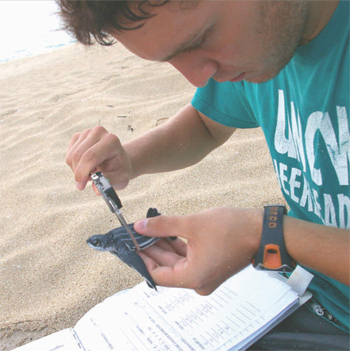 Justin Perrault wanted to understand why hatchling production from leatherback nests is so often low compared to other marine turtle species. What was the problem? He suspected that a contaminant might be involved as the hatchlings that died in the nest had muscle abnormalities that also appeared in cattle (calves!) showing a deficiency in the nutrient selenium. That deficiency is often caused by an excess of mercury in the body, as selenium is used to detoxify mercury. Justin thought that perhaps female leatherbacks were “dumping” excess mercury from their bodies into their eggs. When he obtained blood samples from nesting females, he found that those with the highest concentration of mercury produced nests that suffered the greatest hatchling mortality. He also found that as the females laid additional nests, their blood mercury concentrations declined. At the same time, hatchling production from those later nests increased. Justin also identified where the mercury and selenium came from. Both were found in the leatherback diet (of jellyfish), with some species of jellies containing more of these elements than others. Thanks to this pioneering study, new methods are being developed to treat sick and injured turtles affected by mercury toxicity. 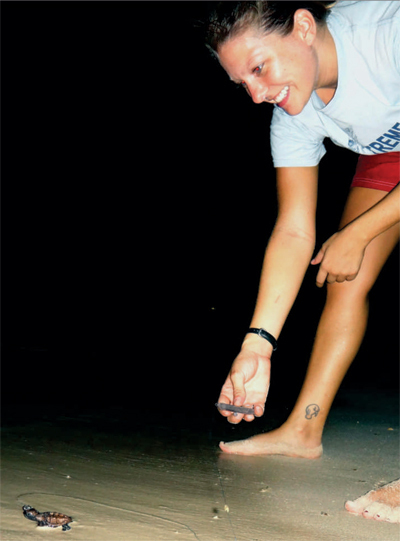 Jessica Pate is studying how a capacity to navigate, which hatchling loggerhead sea turtles possess as they leave their nest, develops. The hatchlings use this ability to migrate from one side of the Atlantic Ocean (our coastal waters) to the opposite side of the basin (the eastern Atlantic) which serves as their “nursery” area for several years before they migrate back to our shores. This amazing capacity depends upon several cues, one of which is the earth's magnetic field. Experiments done several years ago indicated that eggs exposed to abnormal magnetic fields (produced by magnets) result in hatchlings that at least temporarily can't use magnetic information. Jessica is doing studies to determine when during embryological development that effect occurs. She is placing magnets near the eggs during either the first, second and last trimester of development. She then tests the ability of the hatchlings to orient compared to control turtles, exposed to non-magnetic materials during the same time period of development. 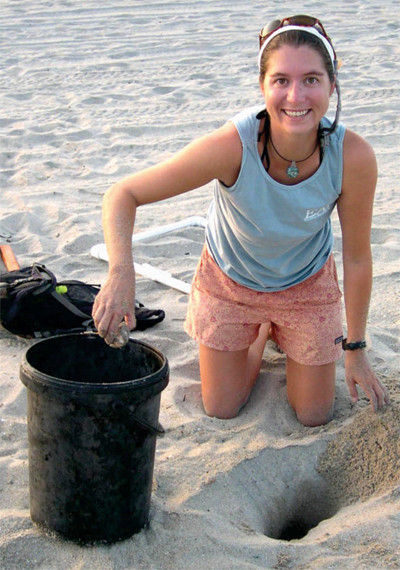 Megan Reising was interested in hawksbill reproduction but since these turtles don't nest in Florida, she worked at a nesting beach in Antigua, W.I. Hawksbills produce the largest clutches (on average, 150 eggs/nest) of any marine turtle and some of the smallest hatchlings. They also nest high on the beach, often in dune vegetation. Why? One possibility was that nests, hatchlings, or both were more vulnerable to predators and other mishaps, and so to maintain their numbers, females had to invest in more eggs. That idea received some support because hawksbills nest on tropical islands surrounded by coral reefs, and coral reef fishes are potent hatchling predators. To test these ideas, Megan monitored the fate of over 200 nests and followed 51 hatchlings as they swam offshore at night, using a kayak. She found that nest productivity was high though some hatchlings, digging their way to the surface, became entangled in plant roots. The real problems occurred in the ocean; ~ 80 % of the hatchlings swimming away from the beach were eaten by predators within minutes after entering the sea. In contrast, predation rates on Florida loggerhead and green turtle hatchlings swimming offshore are much lower (~ 5 %). In Antigua, then, fish predators (and not threats to the nest) may be the natural selector that drives females to produce many eggs.